That seems like a lot of money — until you realize how much Jones makes. Last Thursday, I put up this post about a $35,000 “pay advance” that VisitDallas gave its CEO, Phillip Jones, whose annual compensation when he got the loan was $670,000. I called and emailed Frank Librio, the VisitDallas marketing guy who handles media relations, to ask him about the $35,000 and also why VisitDallas’ 990 nonprofit filing indicated that Jones had a balance due of $135,000. Librio has yet to get back to me. In the days that Librio hasn’t gotten back to me, several FrontBurnervians have pointed out to me that Jones lives in Southlake. To their mind, the guy who promotes Dallas ought to live in Dallas. I actually disagree with that notion. The guy who promotes Dallas ought to spend time in the city and familiarize himself with its neighborhoods and recreational and cultural offerings. Sure. But if he wants to lay his head in Southlake, that’s fine. 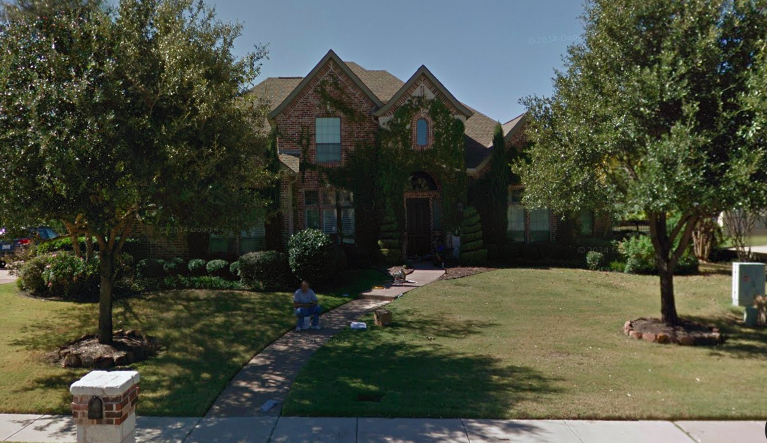 The question of Jones’ residency did, however, lead me to look at his house on Google’s street view. And that exercise raised two very serious questions. Namely: 1) who the heck is that guy sitting on the 5-gallon white bucket in Jones’ front walkway? And 2) what is he doing? When Librio gets back to me, in addition to asking about the $35,000, I will ask about the guy on the white bucket. Then here’s what Evans writes about the “pay advance”: “The loan was tied to a private family issue with the Joneses’ adult son, who is, again, disabled and enjoys living in Southlake.” There are some people who would encounter the “disabled son” forcefield and say, “Oh, man. I’m so sorry. I never should have asked about the $35,000.” I’m not one of those people. Here are the remaining questions: Why isn’t Jones’ $670,000 annual compensation sufficient for handling private family issues? Why, if Jones borrowed $35,000, was his balance listed as $135,000? Who is sitting on the 5-gallon white plastic bucket in front of Jones’ wife’s house? And why, above all, is a nonprofit loaning its CEO money? So I’d like to know how handling Jones’ private family issue directly or indirectly benefitted VisitDallas, whose mission is to draw tourism and conventions to Dallas. Why Did Phillip Jones Receive a $35,000 Pay Advance from VisitDallas?